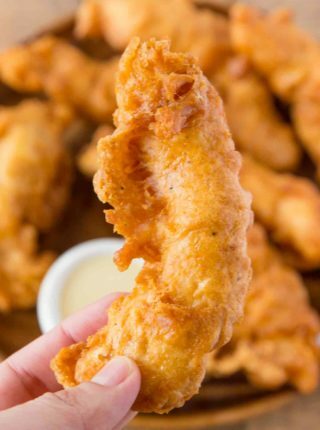 Chicken Fire Poppers are bites of crunchy, sticky, sweet, spicy perfection! Chicken Fire Poppers sound like a funny recipe name, perhaps you’re guessing there is jalapeno and cream cheese inside? When I first came across the recipe on Friday I looked at it and thought, “wow that looks dangerous and delicious!” Then I set off to my favorite two places to research this recipe, Google and Pinterest. Here is the one disclaimer I have to make about this recipe. When you take your first bite you’re going to think this is the greatest recipe in the world. I mean look at this…. But if you get bold and try to eat a lot of it, say I don’t know, a big plateful? You may be feeling the effects of it later. 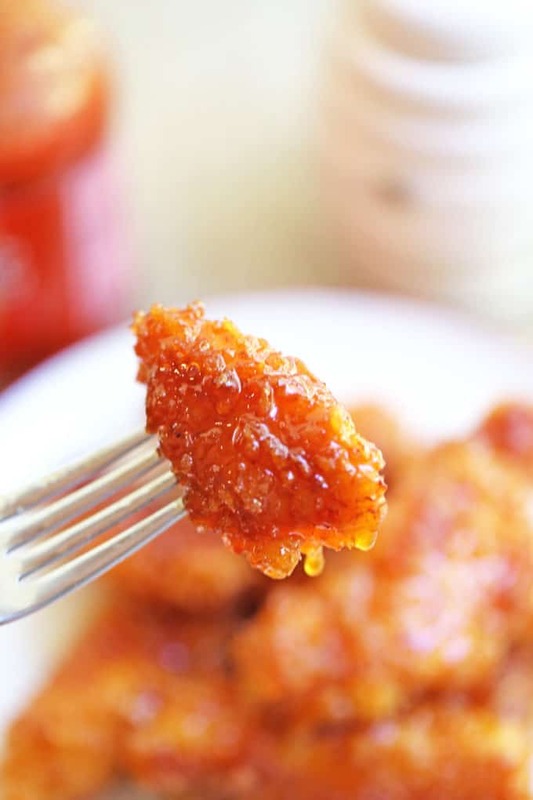 You see the sauce the chicken is coated in is a glorious mixture of sugar, brown sugar, honey and hot sauce. Tastes amazing but in mass quantities it will make you feel like there is a brick in your stomach. So take this as your official warning. This chicken is dangerously, amazingly good…in smaller quantities. Eat the whole batch at your own risk. My husband would probably eat a dinner sized portion of it given the opportunity but I’m listing it as an appetizer because, well, I love you all. Frank’s Hot Sauce – Source it locally in your grocery store if possible to save on the price, but this is the hot sauce you want! Kirkland Signature Honey – Any real honey will work, just make sure what you are buying is actually pure honey. The amount of fake honey being sold out there is astronomical and it is just colored corn syrup. This bottle is great, I get it straight from Costco, but for the price and for the fact I know it is authentic honey, I keep it as my standby. Also, it has a nice mild flavor which is what you want for this recipe. Avoid floral honeys that would have a flavor battle with your hot sauce. 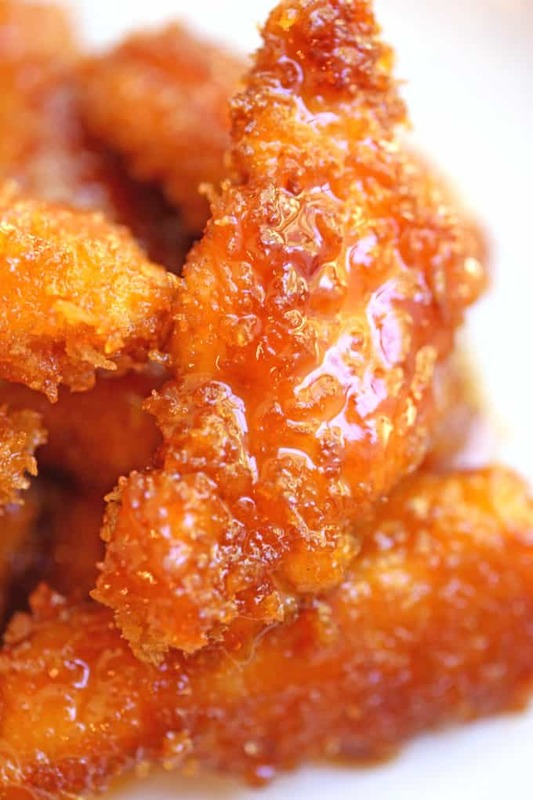 Chicken Fire Poppers are panko crusted, skillet fried then dipped in the most glorious honey-brown sugar hot sauce you've ever tasted and baked until they are bites of crunchy, sticky, sweet, spicy perfection! In a small bowl, beat the eggs with the garlic powder and onion powder. In a second bowl add the panko crumbs. Dip the chicken in the egg mixture, then coat with the panko crumbs. In a large skillet or your cast iron skillet, heat about a half inch of canola oil over medium-high heat. Fry the chicken on both sides until golden and crispy, about 2-3 minutes each side. Don't worry about if the center is done, just get it crispy and browned, then put the pieces into a 9x13 baking pan. 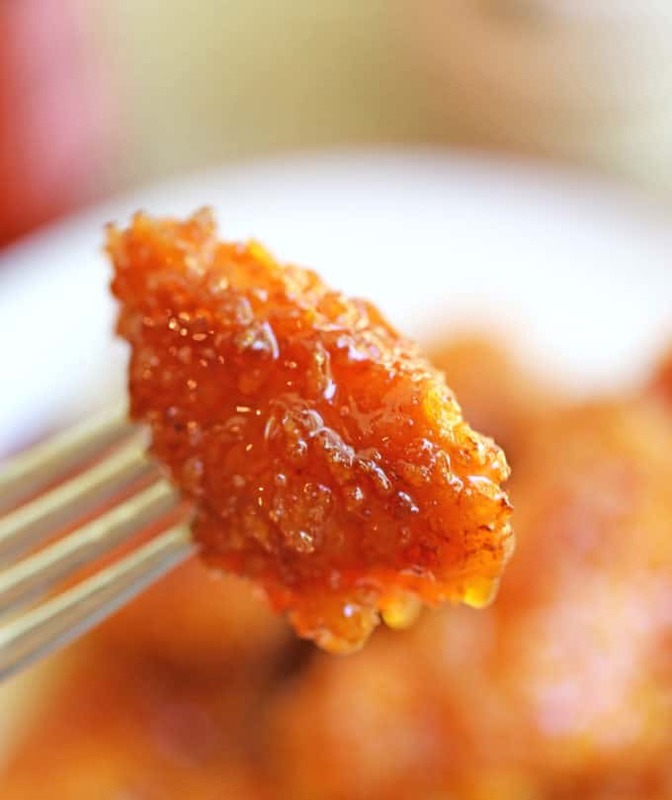 In a bowl, combine the sugar, brown sugar, honey and hot sauce and mix to combine. Pour the sauce over the fried chicken and carefully stir to make sure it is coated. Remove the chicken from the pan, and with a spatula to scrape out the sticky sauce, pour the sauce over the plate of chicken. can you please explain why you fry a bit and then put in oven? 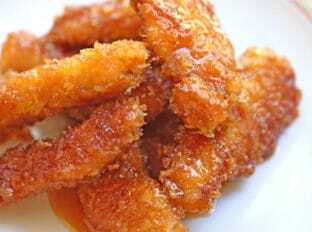 is it for health reasons as not to fry so much in oil, or does it enhance the whole crunchy thing? It really does create a crispier outside. Yes I did survived with a full yummy tummy but still had chicken to cook changed it up and baked chicken with planko like a shake and bake and then put on sauce just as good with no oil will keep you up to date as i play with this recipe ? OMG I Renamed this crack chicken so good ate hole batch in one sitting I’m sure my blood sugar was sky high but couldn’t stop, made with side dish salad and corn, A+ recipe yum yum. Can you line the pan with parchment first to make cleanup easier? I made this recipe, it was great! Nice and spicy. So glad you enjoyed it Jeanine! going through my pins tonight and the two I decided to go ahead and cook were from your blog! thought that was funny, then as I’m skimming through I realized most of my recipes are from you. That’s so awesome! I made this tonight and it came out perfect. I may or may not be eating this with my husband for dinner and not as an appetizer lol. Not gonna lie – I have had this for dinner a few nights too! I’m so glad that a number of my recipes are striking your fancy! Oh my goodness! This looks so good. Love that glaze….yum! I’ve never heard of fire poppers and although I’m not a big fan of spicy foods, I would love to give it a try. You know, like you said, an appetizer. These look totally addictive! 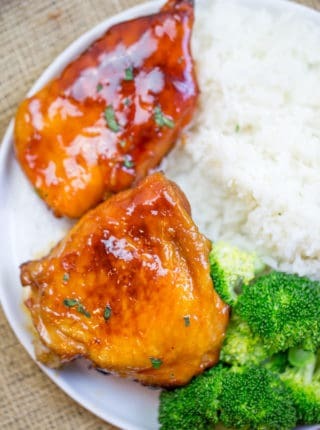 I could easily eat the entire portion and that glaze, irresistible! I haven’t had breakfast yet but I totally want this for breakfast now…LOL! Yup… they look THAT good! I may or may not have had some for breakfast yesterday! O:) Totally true story, and I’m only mildly embarrassed by it. 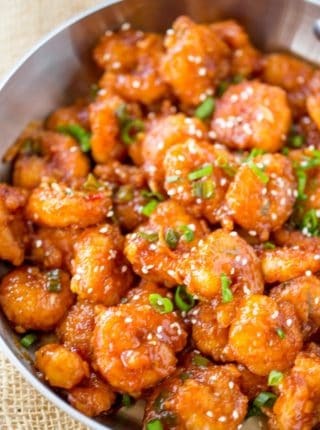 I love the sticky/spicy combination — these look amazingly delicious! Sweet, crispy, spicy chicken? Genius! Gotta try this one soon! My mouth is watering all over my keyboard right now! I want to make these and not share with anyone, haha! I have to be honest – I ate most of them before anyone else could have any! They’re that good! 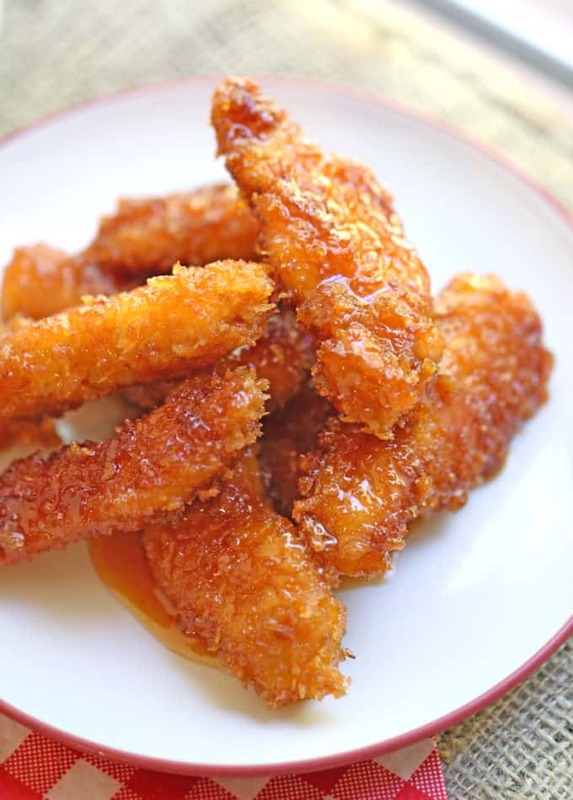 I love panko bread because has a special crunch I can bet you these tenders are to die for!